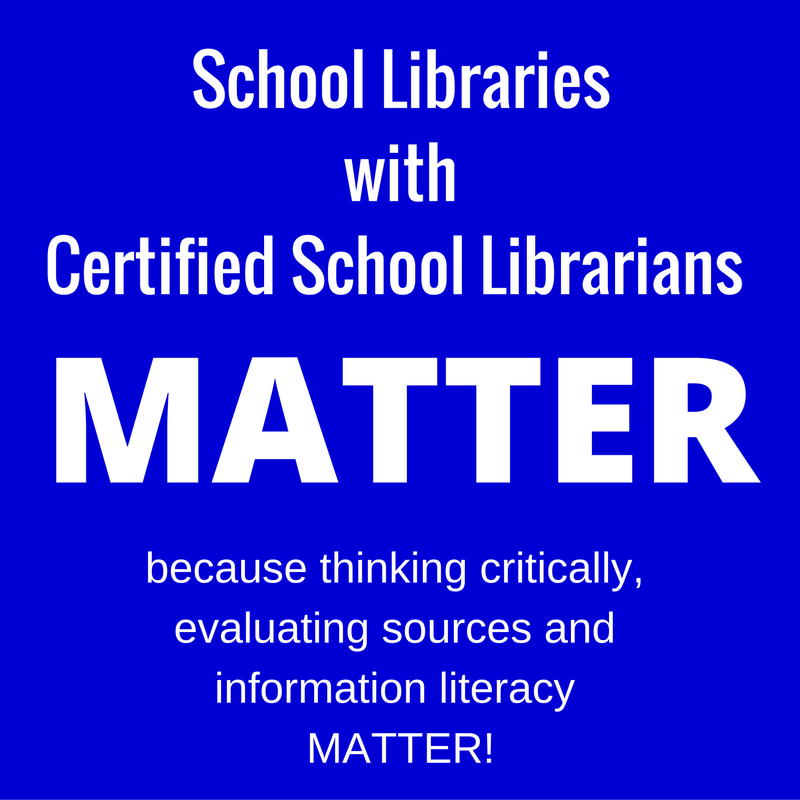 School Libraries with Certified School Librarians MATTER! Someone recently said to me "Well once the students all have their own Chromebooks, they won't need to come to the library." I took a deep breath and I explained that one-to-one Chromebooks will cause even more of a demand for research and information literacy skills and a certified school librarian to teach them. It seems our world today is quick to turn to Google and social media for information without question. The library has always been a place to do and to learn HOW to perform research. The "old" school library was a room filled with books, a few magazines, newspapers, and perhaps some slideshows and VHS tapes. Students found information in print sources alone. Library lessons focused on teaching students to use reference books to access information and how to read for information. It is frightening that people still perceive libraries this way. Today's school library is a hub of learning, a physical and virtual space. Yes we still have print materials. Yes we still believe in reading books. Yes we are a quiet place to work. Today's school library offers so much more. 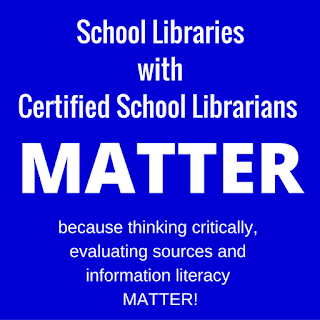 We provide access to appropriate digital resources and databases that have been evaluated and selected by a certified school librarian. We guide students to develop meaningful questions in their inquiry-based learning. We answer information and technology integration questions. We are champions for digital and information literacy. We co-teach with classroom teachers. We provide space for and encourage both collaboration and personalized learning experiences. Which leads me back to the past year. As expected, many Americans turn to the media and Internet for information about the candidates. Facebook, Twitter and Google are used by many to learn about current events and issues. The campaigns knew this and used social media to further their own agendas. News channels and newspapers provided slanted stories. Social media and news media are part of our society and they are not going away. Our world continues to experience and information explosion but not all information is good. In fact, misinformation and disinformation is abundant. Many people don't care. They just look for the information they want to believe whether it is from a reliable source or not. It makes me think about how our educational system has conditioned some students to only look for the answers that we need to succeed on "the test". Thankfully, educational leaders such as George Couros are shaking up learning and encouraging educators to embrace the process of inquiry-based learning, motivating students by allowing them to follow their own interests in curiosities. This cannot be done effectively without research and critical thinking skills. Students love to "Google" the answers to everything. They choose the first result and voila they think they are done. And isn't that what students will do with their own personal Chromebook? Just Google what they think they need to know. Students will need even more direction with their personal devices. Doing research is no longer coming to the library of old and having a limited number of sources to work with. Information on the Internet is limitless. Students need instruction and guidance. My role as the school librarian is to build and maintain reliable print and digital resources. My role is to be a learning facilitator. My role is to teach students to think critically, evaluate sources and to solve problems. My role is to make sure students are information literate. I expect students to be in the library just as much, if not more, when they are one-to-one. The key to this will be to communicate with classroom and subject area teachers, learning their curriculum and offering to collaborate and co-teach. I want my students to be citizens who don't take what they see and hear on the Internet or media at face value. I want them to intelligently question and challenge misinformation and disinformation. I want to give them the tools to make this country a better place for their own children someday. I want them to know how to find reliable information. I want them to be information literate in this digital age. Whenever I move to a new area my first stop is the local library. Libraries certainly are places of quiet refuge, but also vitally important educational resources. Whether within a school system or for use by an entire community "the library" has always been a busy hub. We are currently living on an island in NC and our library caters to several towns. There is constant activity for adults and children - always something exciting happening there during my frequent visits. Kudos to the librarians who cope with every phase of a library's working and fiscal needs, for their educational expertise and for their smiles always at the ready to welcome us in. Thank you Barbara. I learned the value of the library at a very early age. My mom brought me to the library every week when we were growing up. We walked a mile to get there because mom did not know how to drive, not that we could have afforded another car. We could check out as many books as we could carry home. I would love to bring my son to the library every week but I am like many well intentioned and full time working parent who doesn't always have the time, which is yet another reason school libraries are so important. And you were one of my favorite patrons! Thank you! Love it! We need to keep advocating and putting these posts where decision makers and stakeholders see them!! I agree! Unfortunately we tend to be talking to librarians who already know all of this. We need to talk to senior leaders in schools to effect change. I am challenging myself to write and share in education circles wherever I can.